Embrace the full Executive MBA experience at a pace that suits you with our flexible option. The programme extends over 26 months, and also gives you the option to take a break in-between modules. It is a creative approach that you will find both fulfilling and accommodating. Listen and learn: Recent graduates share their key take-aways from the CBS Executive MBA experience in this podcast. Tine Weisshappel Holmboe landed her dream job after the CBS EMBA. Hear her story in this video. 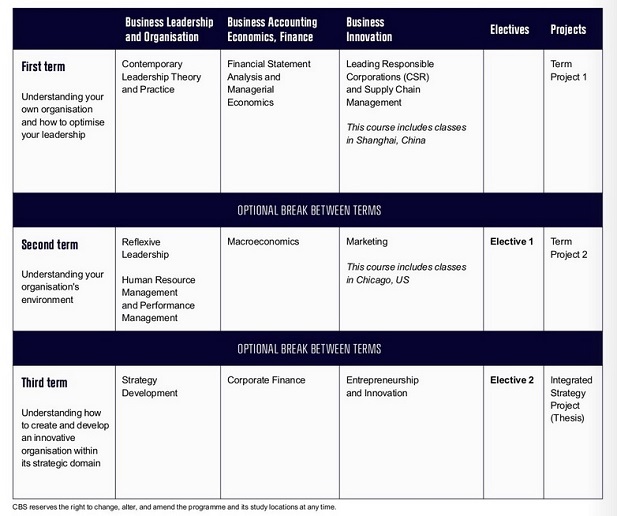 The Executive MBA with Flexibility stretches over 26 months and allows you to take a break in-between terms and resume studying when your schedule allows. This means you can complete the crucial last term at any time within five years of starting the programme and still graduate with a full Executive MBA degree. The classes will be held on Fridays and Saturdays every other week. The tuition fee for the Executive MBA with Flexibility is DKK 390,000, payable in three instalments. The fee includes all expenses in connection with your study apart from the accommodation in Copenhagen and flight tickets. Please note that the tuition fee is subject to change both in price and in the planning of the programme. Ours is a globally-focused programme that brings together senior executives and faculty from around the world. You will develop and refine a strategic mindset and gain an understanding of the newest management tools used by business leaders in today’s fast-paced world. "For me, having a degree of flexibility was important. Holding a full-time, senior executive job while pursuing my Executive MBA is a significant workload. I took advantage of the flexibility and planned ahead so that exams and class participation wouldn’t clash with work engagements." The Supply Chain Management course will take place in Shanghai, led by faculty from Cranfield University. The Marketing course will take place in Chicago, with classes at Kellogg School of Management. In addition, you will hand in your final thesis at the end of this term – before being awarded with your Executive MBA degree at a graduation ceremony!